Emily Ficken could be described as an engaging, vivacious kindergartner. Her easy smile and desire to learn made her an active student whom both teachers and students liked. Emily graduated Cary Christian School (CCS) in 2011 and received a degree in Elementary Education at North Carolina State University with a concentration in STEM (science, technology, engineering, and math). She assumed her CCS years were fondly behind her, only expecting them to be pleasant memories. 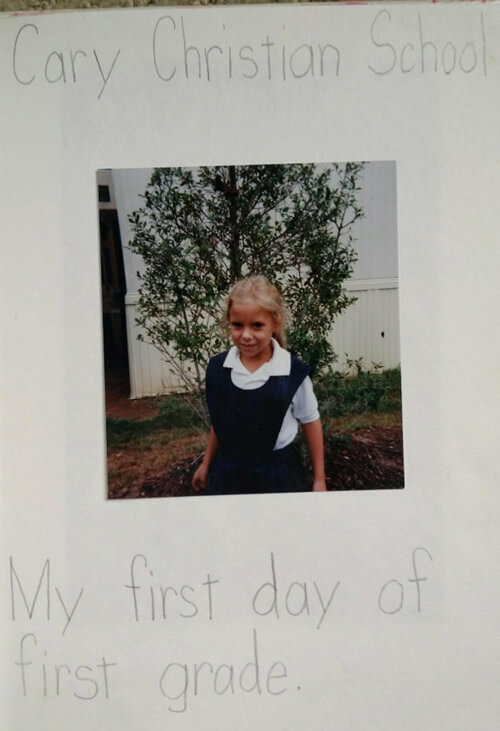 However, Emily believes Proverbs 16:9, “The heart of man plans his way, but the Lord establishes his steps,” so it was no surprise to her when she found herself returning to CCS, not as an alumna going to an occasional Homecoming football game, but now as Mrs. Emily Nelsen, first grade teacher. While Emily cherishes her memories as a student at CCS, she is now responsible for sixteen eager students of her own throughout the day. “I always say I am trying to teach them to be better people, and there is so much training involved in simple skills such as politeness and kindness. There is much material to learn, and I want them to enjoy school and have a desire to learn. That is another reason why I love first grade so much!” explained Emily. Emily enjoys engaging and motivating students while assessing where they are as learners and children. She is fascinated with discovering techniques that draw out a child’s natural desire to understand and learn new concepts. Combining the incredibly valuable classical model with her own teaching personality, she strives to help students know they can succeed. Emily and her husband, Chris attend The Summit Church in Cary. This summer, prior to their wedding in August, Emily worked as head of female staff at Camp Oak Hill in Oxford, NC. After the wedding, Emily returned to CCS ready for a year of teaching and a new chapter in her life. It is a special honor to have a former CCS student now be welcomed back as a teacher.